Hello, Friends! Do you feel the rustle of the silk robes and hear the whisper of parchment paper? Yes, people...it's graduation season and all across the globe, young people are lining up to receive their hard earned diplomas. There will be tears and cheers, perhaps a few fears and loads of good wishes as friends and loved ones gather to send these grads out upon the Sea of Life. 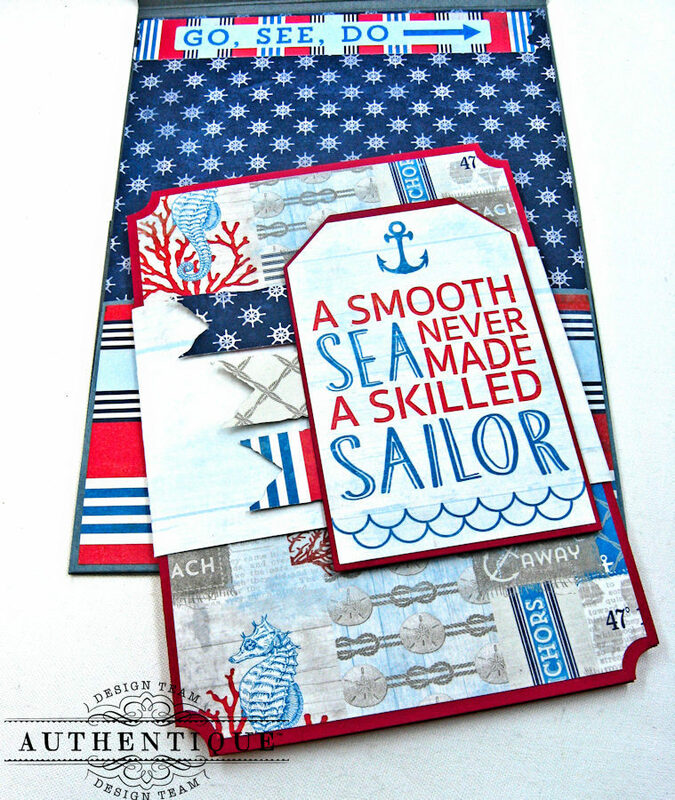 I've used Authentique Paper's Seafarer Collection  to create this trio of Have Courage, Set Sail & Dream High Nautical Themed Graduation cards. 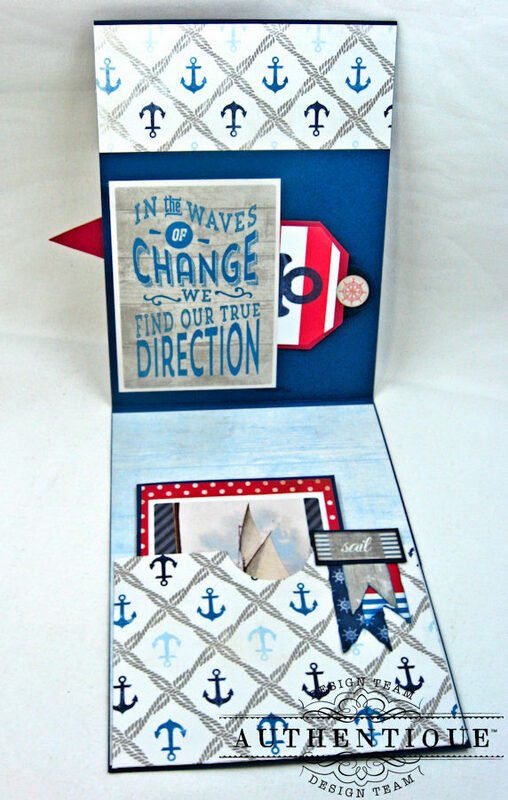 Masculine cards can be a challenge, but I found that this collection made them very easy to design. 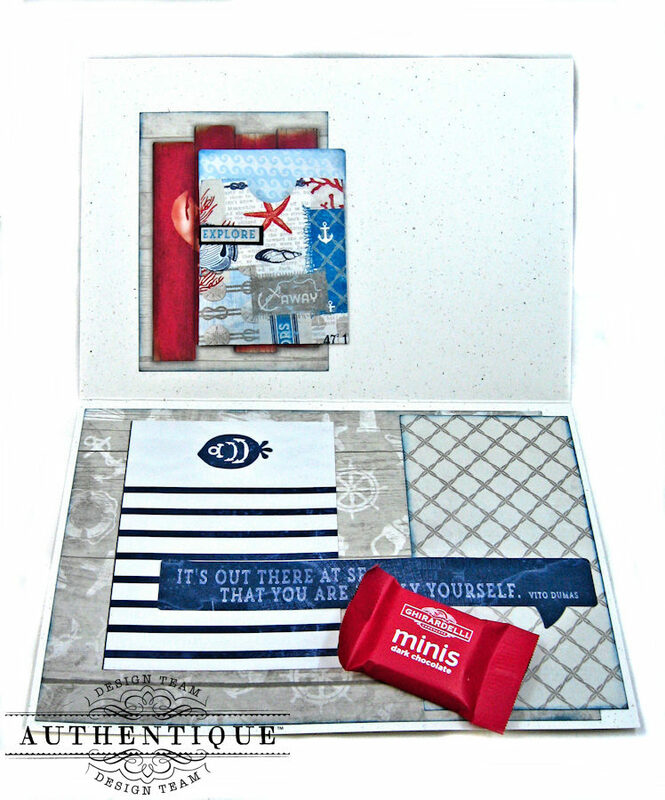 This 5" x 7" top fold card came together very quickly thanks to the wonderful designer paper and focal image. I tied hemp string with a bowline hitch knot to amp up the nautical vibe, then suspended an antique brass sailing ship from it. 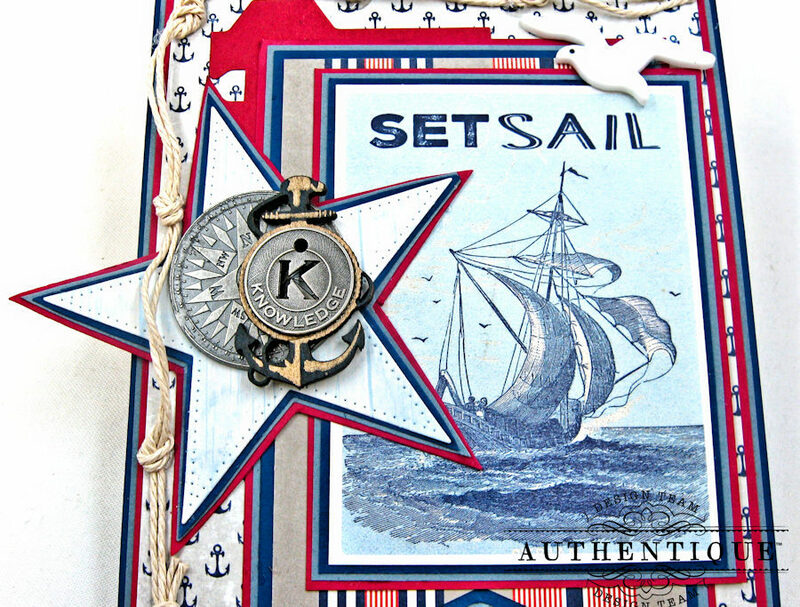 Tim Holtz' Ribbon Flags die makes wonderful little embellishments . 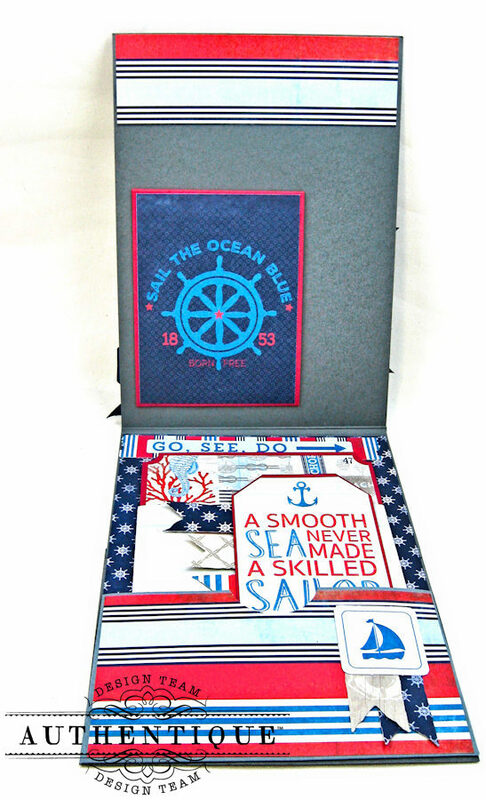 Double matting the layers on red and navy cardstock gave everything a clean, crisp finish. 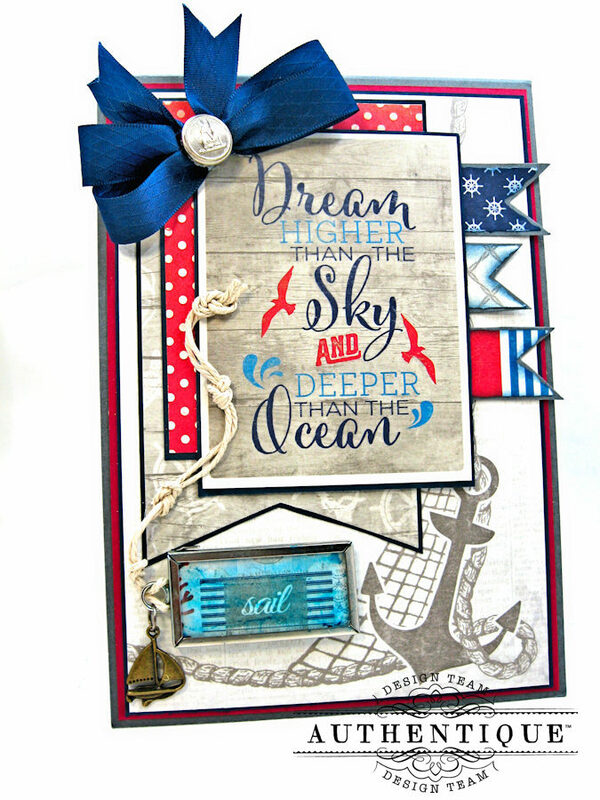 A bow, a nautical button and a charm made by fussy cutting an image from a sheet of designer paper finish the front of this card nicely. Because I created the card base with a 1/8" spine, I was able to add two pockets to the interior. The smaller pocket is made with one of the 3x4 images from the cut apart page. It's just the right size to hold a gift card. The larger pocket on the bottom of the card holds a 4.25" x 6" folio that is the perfect spot for those keepsake graduation photos. A decorated belly band and a few more ribbon flags dress the folio up nicely. What could provide a more perfect graduation metaphor than this image of a ship, its sails full-blown and ready to meet life's challenges full on? 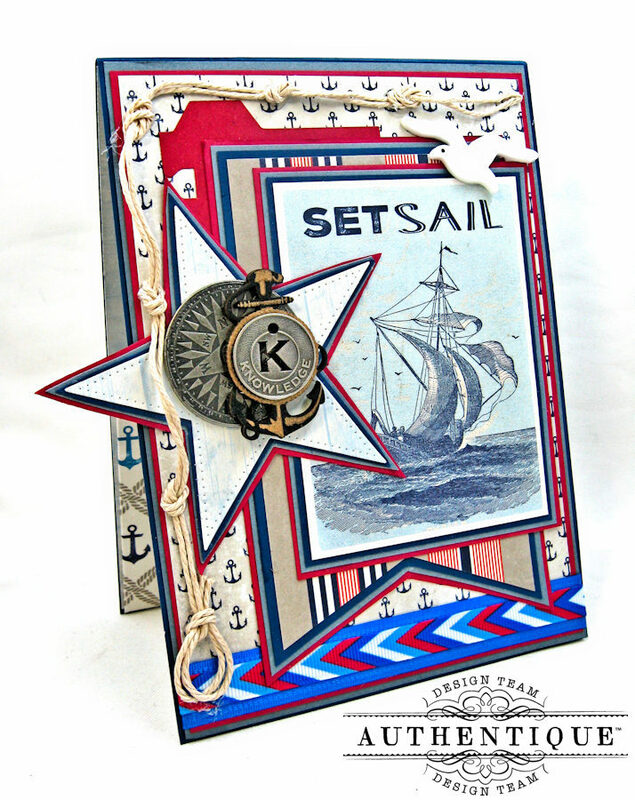 I used a star shaped die to create the accent on this card, then topped it with an Idea-ology metal compass coin, a muse token and wooden anchor. 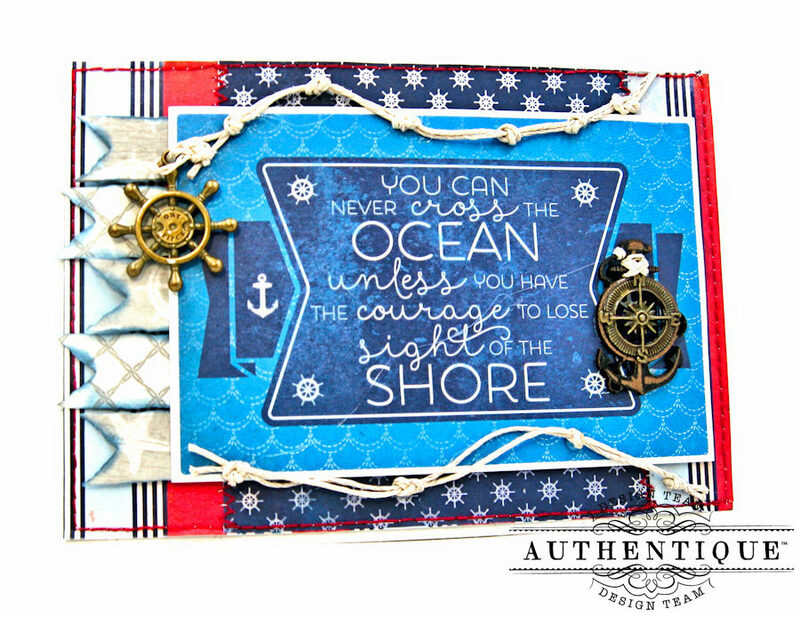 More bowline knotted hemp string and a pretty white sea gull complete the front of the card. 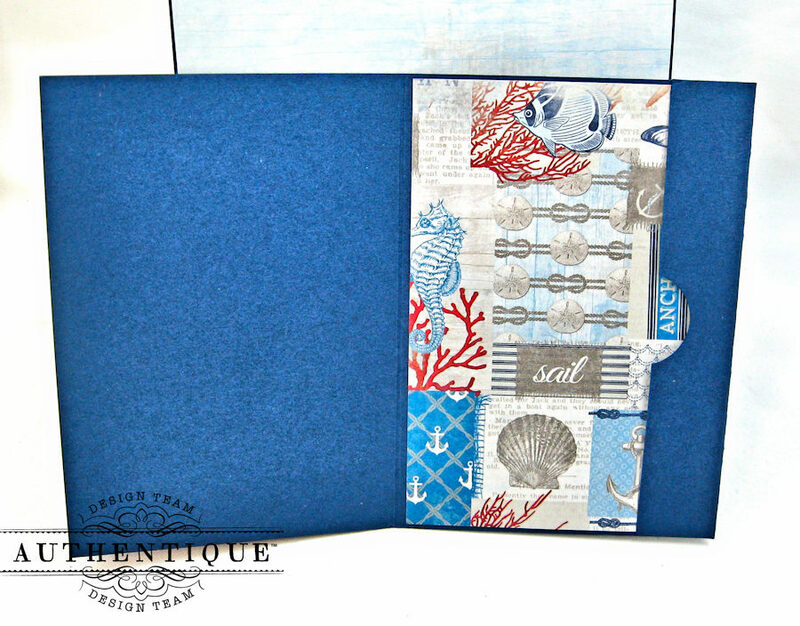 This 5" x 7" top fold card has a 1/8" spine to accommodate the inner pockets. The top pocket holds a little tag/bookmark. Write your best wishes on the back of the tag and tuck into the pocket. Interactive cards like this are always a hit! The large bottom pocket contains another folio that I decorated with images from the paper collection. 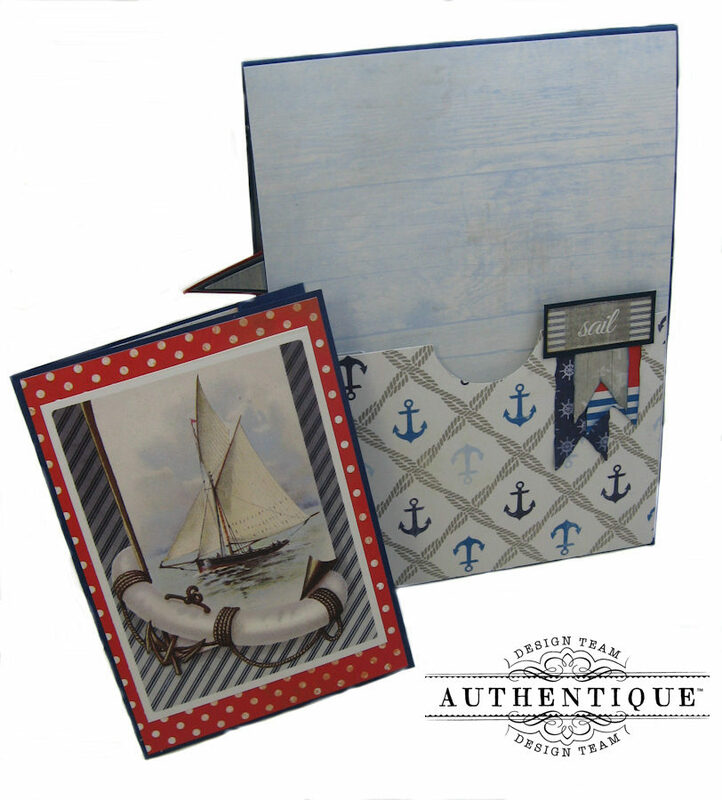 The folio contains a gift card pocket, and room for a graduation photo. 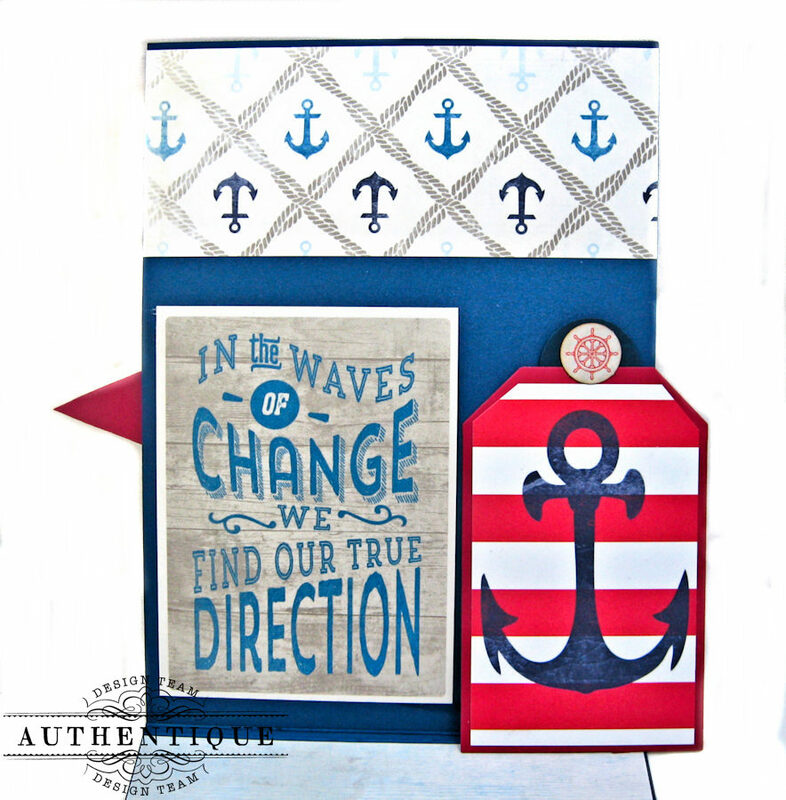 The sentiment on this 7" x 5" Have Courage card is just perfect for graduation. I turned the card base on its side to accommodate this large sentiment panel. 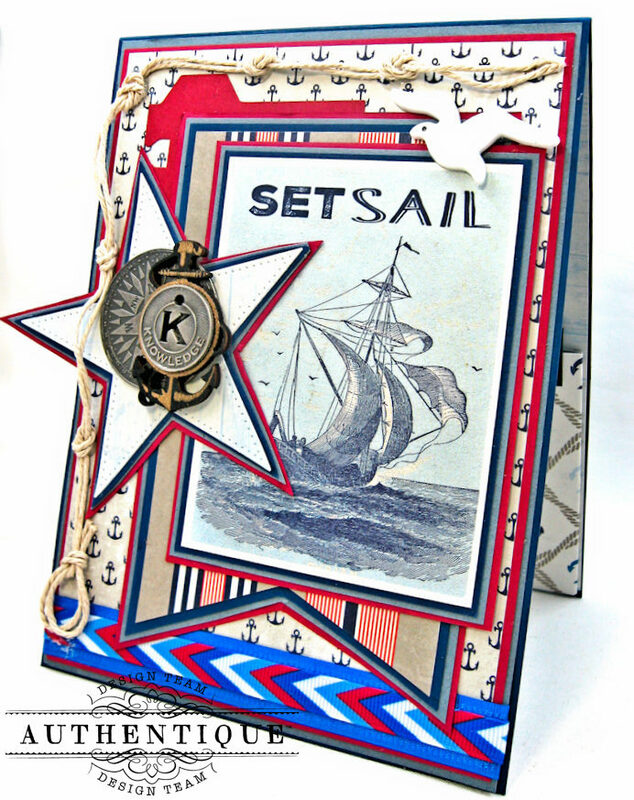 Then I added banner flags, machine stitching, knotted hemp string and some nautical charms to complete the card front. 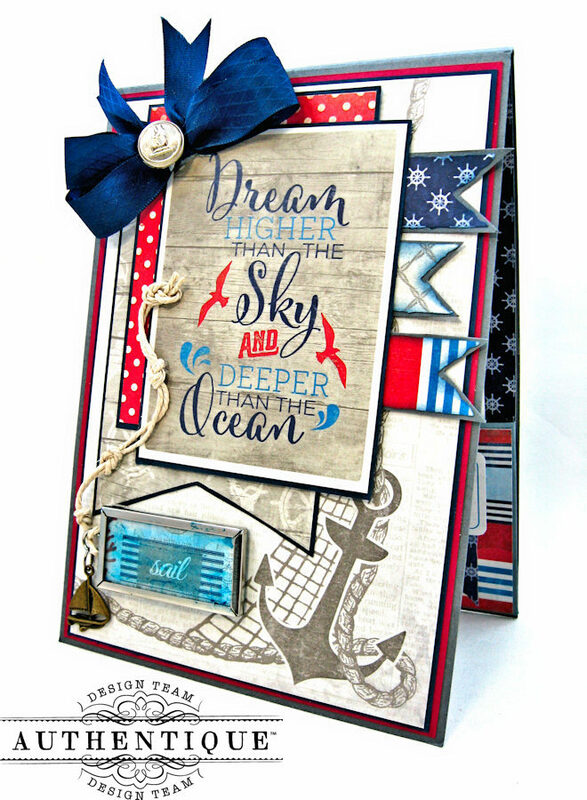 LOVE this fabulous card and all the gorgeous layers! 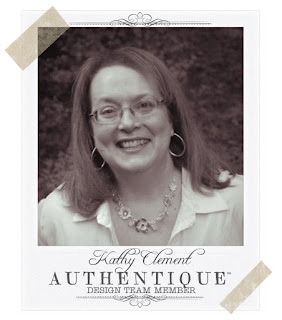 I love the new line, gorgeous, awesome, beautiful!!!! Love, Love, Love it!!! Alot of wonderful projects with this line, can't wait to get it! !